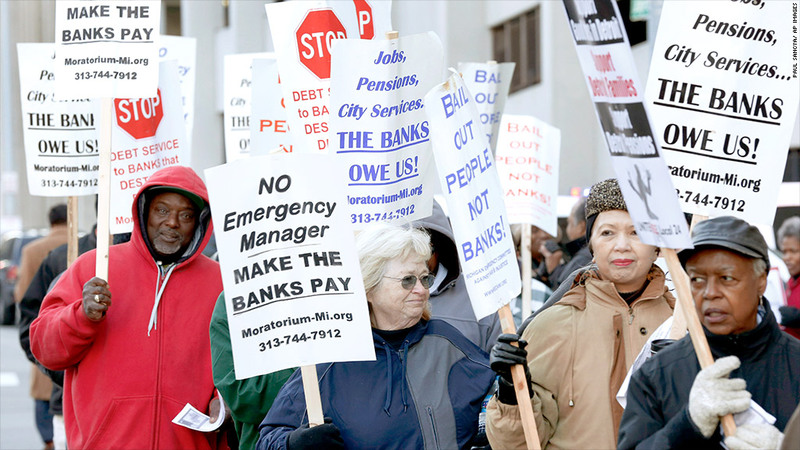 Detroit workers and retirees protested possible pension cuts last fall. Thousands of retired and current Detroit workers face pension cuts as deep as 34%, and some say they aren't sure how they'll make ends meet if the plan announced Friday is approved. "They have worried me from the day they started this mess. You sit on pins and needles all the time," said 69-year-old Donald Smith, who retired in 2005 after decades of work as a civilian detention officer and other general city jobs. For Smith, the cuts could mean a loss of around $300 a month from his $889 in monthly pension benefits, even as he already struggles to pay for rent, groceries and medical bills. Between his pension and Social Security, Smith currently lives on less than $23,000 a year. "If they go and cut that, how am I going to live off of that?" he said, "I can't live on what I get now." At the same time, retirees could face increased medical bills due to proposed deep cuts to their retiree healthcare benefits. Starting next month, the city will stop providing coverage for retirees who are not yet eligible for Medicare, and instead provide a monthly stipend that they can use to buy coverage through the Obamacare health care exchanges or another employer. Retired firefighter Les Blackburn, 55, has received a disability pension of around $45,000 a year after being injured on the job in 2004. He is now back in school to pursue a new career as a nurse, but he said he is especially worried about the effect of cuts on older retirees. "I'm very afraid of what's going to happen. I'm working on another career," he said. "But a lot of people are too old to go out and get a second job." General city employees and retirees, such as sanitation workers, are facing the severest cuts, while police and firefighters, who typically don't receive any Social Security payments, face an up to 10% cut in their benefits, according to the city's bankruptcy plan filed in court Friday. The cuts still face a long road to approval by the bankruptcy court. And the plan provides possibilities in which retirees could get a break. For example, it offers reduced cuts -- only 4% for police and fire pensions and 26% for other retirees -- if creditors reach an agreement with the city. A summary of the plan also notes that a proposed infusion of state funds would go toward ensuring retirees don't fall below the federal poverty line, but further details were not provided.